Have you adjusted to working out of your kitchen with your dog at your feet or at your local coffee shop? If so, you’re not alone. 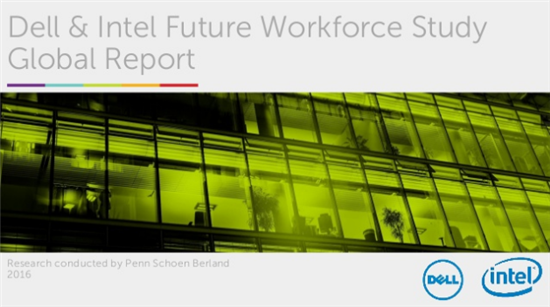 Today, over half of global employees already work outside of a traditional office at least one day a week, while 18 percent are working remote every week, according to Dell and Intel’s third Future Workforce Study. In fact, not only do employees find working remotely convenient, workers are finding virtual work provides greater productivity as well. Over one third of all employees believe they are more productive working outside of the office, while 28 percent note they get more work done while remote due to the reduced commute. The Future Workforce Study identified millennials as the primary influencer of the work remote trend. Thanks to this generation’s flexible lifestyles and desire to adopt new technologies, they are expected to inspire additional changes in the workplace in the near future. With their willingness to embrace new technologies, millennials globally care strongly about having access to these tools on the job – 82 percent say tech would have an influence when deciding to take a new job. In contrast, 67 percent of workers over 35 years old feel the same way. The survey results show that employers that don’t start recognizing this now will likely be facing major talent and retention challenges in the near future. With the influx of innovative tools including virtual reality, augmented reality, artificial intelligence and Internet of Things (IoT) making great gains – employees, and not just millennials, are becoming more open and wiling to embrace these offerings at work. Two thirds, of the global workforce we surveyed would be willing to use AR/VR products in their professional lives, while nearly half believe the technologies will improve productivity within their role at work. More and more employees have made it clear that they’re ready for workplace tech to keep up with their way of life – providing resources and tools that create and stir collaboration and productivity. 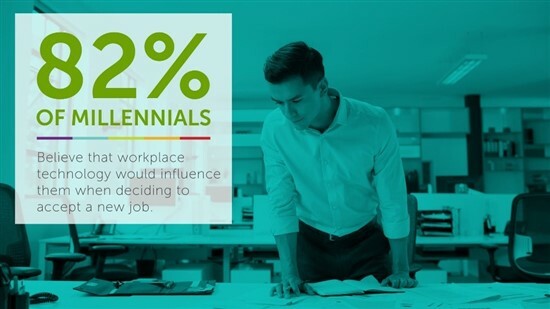 The direction employers need to move in is clear – 70 percent of millennials feel that advanced tech/smart offices are crucial to a collaborative, productive and efficient work environment. At the same time, the move towards a smarter and more mobile workforce still presents challenges for the employer. According to our recent Dell Data Security survey, 95 percent of all security breaches originate from an employee device/endpoint and 73 percent of businesses are concerned about malware and advanced persistent threats. Integrating these new technologies means companies need to be thinking of a pragmatic and secure approach to managing these expanded IT environments. Check out the full Future Workforce Study and let us know how the findings match up with what you’re seeing in your job/office on Twitter using #FutureWorkforce.